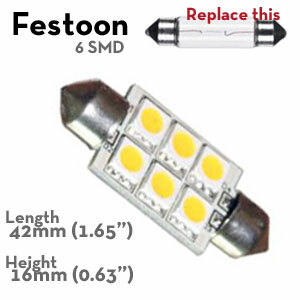 6 SMD LED bulb. Festoon LED lamp / marine light bulb for boat lighting. 12 volt LED with 6 SMDs and festoon-type socket.This LED is able to function on an input of 10-30 volts DC. I searched all over the web until landing on Sailor Sam's site. The festoon bulbs work perfectly. They arrived within a couple days of being ordered and earlier than the scheduled arrival date! I'm currently replacing all lighting on my Bayliner 3288. Thanks for making this process so easy. This bulb is much brighter than the incandescent bulb it replaced.